No plans for the 4th of July? Head to one of these family resorts, all of which are offering 4th of July packages for families. Nothing says summer like an escape to Woodloch Pines in the Poconos. The resort offers all-inclusive rates that cover accommodations, all meals and most activities. The Stars & Stripes Summer Escape package runs from June 29 to July 2 and the celebration includes a meal plan, cookouts and fireworks. Visit Woodloch Pines’ official website for more information. The Mountain Lake Lodge in Pembroke, Virginia, is offering a July Fireworks Celebration Package that’s perfect for families. This 4th of July hotel package includes three nights’ lodging, breakfast daily, and of course, fireworks! Fireworks will take place on Monday, July 2. Visit Mountain Lake Lodge’s website for more information. Stay at the Inn on Biltmore Estate for a nearly all-inclusive package. 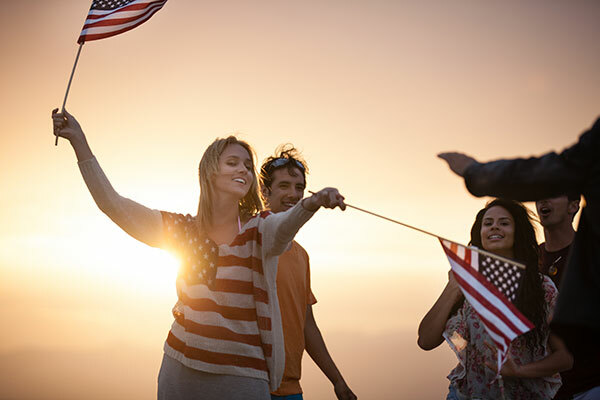 The July 4th Celebration Package includes two nights’ accommodations, buffet breakfast daily; a July 4th Celebration Dinner (with games for all ages); admission to the Biltmore Estate (audio guided tour); and a fireworks show. Bonus: Arrive July 2 or stay through July 5 and you’ll receive $100 off your stay. Visit Inn on Biltmore Estate’s website for more information. The Broadmoor, a destination resort in Colorado Springs, is offering a four-night package for the 4th of July. The package includes accommodations; a $300 dining credit; horseback trail ride or Garden of the Gods Jeep tour; admission to Seven Falls; and discounted adult admission to the Cheyenne Mountain Zoo. Suites are discounted 25 percent with this promotion, as well. Visit The Broadmoor’s website for more information. The July 4th Celebration at the Atlantic Oceanside Hotel and Event Center includes three nights’ lodging, two tickets on the Acadian Fireworks Cruise (additional tickets available for purchase), two tickets to the 4th of July BBQ dinner and free continental breakfast each morning of your stay. Bonus: Kids under age 12 stay free! Visit Atlantic Oceanside Hotel & Event Center’s website for more information. Spend your holiday weekend at the Meadowmere Resort in Ogunquit, Maine, a leisurely walk or short drive from the beach (where fireworks will take place). This Maine vacation package includes continental breakfast, discount passes for nearby York Wild Kingdom Zoo Park & Ride, and free Wi-Fi. Visit Meadowmere Resort’s website for more information. Head to the White Mountains of New Hampshire for the 4th of July! The White Mountain Hotel is offering a 4th of July Lobster Bake Package that includes accommodations, complimentary breakfast daily and a bountiful Lobster Bake on July 4 — served poolside, of course! Package is available for arrivals on July 3 or 4, 2018. Be sure to plan a visit to Story Land while you’re in town! Visit White Mountain Hotel’s website for more information.